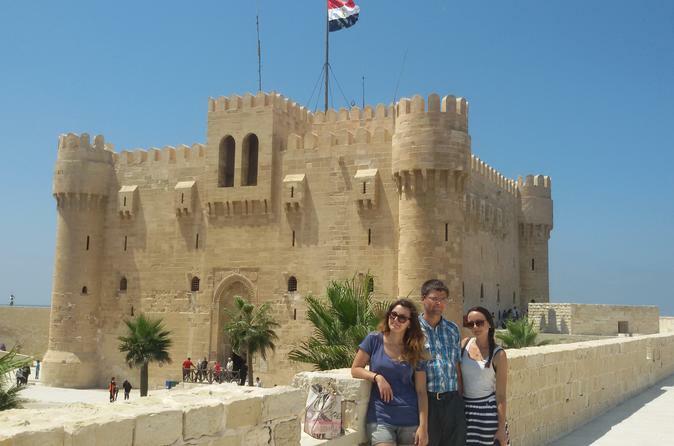 With a fascinating private Alexandria tour from Cairo in the company of your own Egyptologist guide, you’ll enjoy personalized attention on your private tour of Alexandria. Your first stop in this historic city will be the catacombs of Kom el Shoqafa which are the largest known Roman burial site in Egypt,you will descend by the stairs and explore the spooky tunnels with three levels of tombs that could accommodate up to 300 corpses. Moving on to visit Pompey's Pillar, which dates back to the 3rd century. It is a massive 25m pink granite column that measures 9m around its girth. The column is the last of the remaining relics of the Seraphim Temple during the Greco-Roman period, it is the biggest memorial column in egypt. Then enjoy having lunch at fish market restaurant. Then, you will go to get a photo stop at Qaitbey’s Citadel, which is considered one of the most important defensive strongholds, not only in Egypt, but also along the Mediterranean Sea coast. The Citadel is situated at the exact site of the famous Lighthouse of Alexandria, which was one of the Seven Wonders of the Ancient World. You will end your amazing tour by visiting the Modern Alexandria Library (visit its open court + free museums), in your way to the library will cross Stanley Bridge, one of the gorgeous modern buildings in Alexandria. The Old library was very famous all over the world for its huge books capacity of different sciences and literature. It was damaged several times during the Greco Roman period until it vanished. The design of the modern library of Alexandria consisted of four underground stores and six upper stores. The special shape of the modern library of Alexandria is considered a special architectural germ. After this trip you will be driven back to Cairo to get back to your hotel.